Our lodging units are open for business, but the restaurant & lounge are closed due to a fire. On January 12, 2018, the Restaurant & Lounge burned down. We hope to rebuild it. The lodging units are fine. This log building hosts both the Cottage and the Loft units. The Loft log cabin can sleep up to 13 people and has a stone fireplace. The “Apartment” includes a kitchenette and balcony deck. The Cottage is a one bedroom log unit with extra beds for sleeping up to 5 people. Motel Units 1 & 2 are identical with 2 queen beds. Motel Unit #3 has four single beds and can connect directly with the Apartment for larger groups. The Hill Motel provides outdoor enthusiasts with year-round direct access to Minnesota’s natural amenities. Conveniently located on Minnesota Hwy. 46 in Squaw Lake, MN, we have seven exceptionally clean and comfortable lodging units that sleep from one to 11 people, and feature air conditioning, cable TV and wi-fi. One unit even has a gas stone fireplace. Ample parking is provided and convenient outdoor electrical outlets are available in the parking area for charging batteries or plugging in vehicles on cold winter nights. The Hill Motel is centrally located to many of the best walleye, northern pike, muskie, bass, crappie and panfish fishing lakes in Minnesota. We’re only 5 miles from the north end of Lake Winnibigoshish’s state-owned boat landing and great fishing on Lake Winnie and Cutfoot Sioux Lake. We’re just 45 minutes from Red Lake and there are many other great fishing lakes like Round, Island, Sand and Bowstring within a short driving distance of the motel. ATV Riding is a very popular activity in this part of the state. 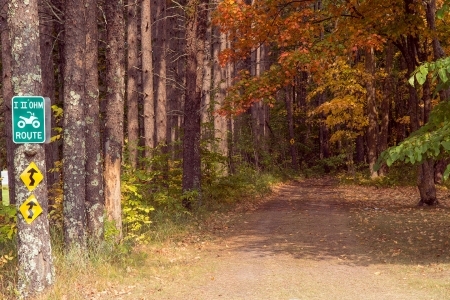 Hundreds of miles of ATV trails wind thru the northwoods and around lakes, rivers and wetlands. Itasca County has even adopted an ordinance that allows the operation of all terrain vehicles (ATVs) on all county roads except one. There are many area attractions to discover during your stay at The Hill Motel. From championship golf, bowling, and casinos, to the Chippwa National Forest’s “Lost 40” and day trips to Itasca State Park, Ironworld Discovery Center and Soudan Mine, you’ll never run out of things to see and do. The Hill Motel makes a great base camp for your next northern Minnesota hunting trip. Whether you’re hunting for grouse, waterfowl, whitetail deer or black bear, our amenities and location make us a great choice for fall lodging. We’re primed for winter at The Hill Motel! Our repeat ice fishing guests say we offer the best centralized location for fishing jumbo perch, walleye and panfish on the best area ice fishing lakes. Our heated on-site fish cleaning house is spacious with running water and electricity. Maybe this is the year you’ll get hooked on darkhouse spearing as well. The Hill Motel is snowmobile friendly, with parking allowed right up to your door and outside electrical outlets to plug in your vehicles! We have some of the best groomed snowmobile trails in Northern Minnesota, and the Avenue of Pines trail system goes right past the motel’s parking lot. We have the central location and comfortable lodging to keep you coming back year after year. Give us a call today to make your reservations: 218-659-9220. Heading up or down State Hwy. 46? 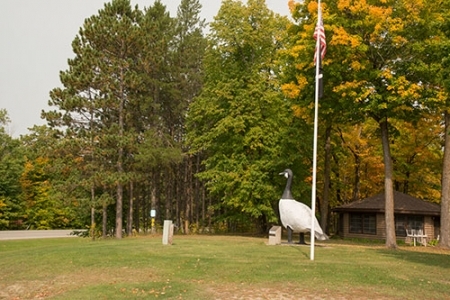 Look for our Goose Mascot in Squaw Lake and then stop in. Early on the morning of Jan. 12, 2018, the Hill Restaurant & Lounge caught fire. 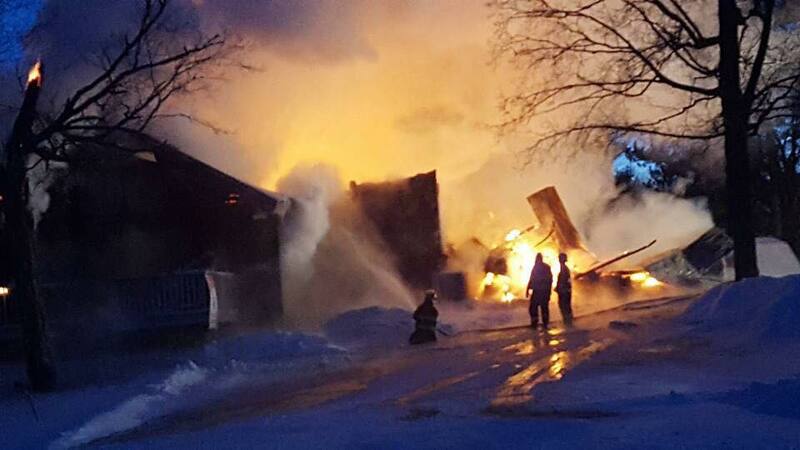 Despite the valiant efforts of multiple area fire departments in the -20 degree weather, the building was a complete loss. We are devastated over the loss – so many years of history and community, gone. The motel, the loft, the cottage, and the laundromat are in separate buildings and were not touched by the fire. We welcome and encourage you to stay with us in any of these units. Also, if you already had reservations for 2018, please contact us as soon as possible to confirm your reservations at 218-659-9220 since we lost our reservation book and computer files in the fire. We have added a page dedicated to the restaurant and lounge here, (this page still under construction) and will keep everyone posted as we move forward with future plans. Grieger Concrete & Construction of Squaw Lake, Minnesota, understands what it takes to give you a sound investment with top quality products and professional service. Serving all of Itasca County and surrounding communities, Jerry Grieger is fully equipped to handle new, repair and replacement, and custom projects, both residential and commercial. Grieger Concrete & Construction provides decorative stamped and colored concrete, concrete driveways, patios/porches, concrete steps, sidewalks and walking paths, basements and garages and commercial concrete work including concrete parking lots, concrete floors and concrete repair and replacement. Grieger is also your source for quality turnkey home construction, roofing, general construction and landscaping. Call Jerry Grieger today at 218-244-6179 to set up a Free Estimate. No job is ever too small or too large. © 2018 The Hill Restaurant, Lounge & Motel. All rights reserved.